Although many charter areas are suitable for sailors with basic navigational skills, it is not always as easy as it looks. And even if it is easy, different or unexpected conditions may make some cruising grounds become difficult. Assess honestly your and your crew's sailing abilities, especially if your crew is composed of non-sailors or almost beginners. Remember: You are going sailing for fun and great memories, not to get yourself scared silly! Once you have located an area that seems to suit you, call the charter company and talk to the representative. Tell him/her about your skill level and make sure to listen to the advice. Use the Internet. Go to a sailing forum of your choice, like, for example, traveltalkonline.com and browse the archives. Ask questions. Don't be embarrassed. Many charterers will make a point to guide you. Also, we have here a chart rating the world charter areas by skill levels. Understand a marine chart, longitudes and latitudes, symbols, markers, depths, danger zones, etc. Keep track of a position either by dead reckoning or with a GPS. Even in the easiest cruising grounds like the BVI's, you will need those skills if you get caught in a windy rain squall that will blind you and can make you drift quickly into a dangerous zone. In some other cruising areas, there are so many little islands that one can get very quickly disoriented. Evaluate distances to obstacles and estimate a collision course with another vessel. The latest edition of a cruising guide of the chosen area. Most latest editions will have GPS waypoints included. Most charter companies will also send you some material way in advance of your cruise. A marine chart of the area. Although you will find one on board your charter boat, it is a good idea to get your own in advance, just to get acquainted with the area. Besides, the one you will buy will surely be the latest edition, and you can re-use it for a later cruise. 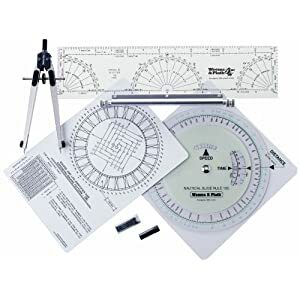 A basic charting kit with parallel rulers, dividers etc. This also will be in your boat navigation table. However, inquire in advance. For most sailors, including me, the fun of a charter cruise starts way before we board the boat, and that is when we prepare the itinerary. You see, it's like we are already there, cruising... Besides, it is not a good idea to wait until you get there to start preparing this. Even if you decide to make changes after you attend the charter briefing, at least you will have a pretty clear idea of what the briefer is talking about. Now, you may proceed: If you are going to one of the charter destinations covered in our Cruising Logs, download the log and print it as a reference. Whether you are using our logs or not, use the cruising guide and the chart at the same time, make a list of the places you want to visit. Always keep in mind your skills and your crew's, as well as prevailing winds -they will shape your itinerary- and currents. Plot the route, the distance and the sailing time of each segment. Caribbean charterers will generally be exposed to shorter distances between anchorages. Whereas in Europe, distances between ports tend to be longer. Also, in many parts of Europe tide tables have to be followed closely. Get familiar with the weather patterns of the area where you are going. Again, all the charter cruising grounds are depicted with blue sky and gentle winds. It is not the reality all the time, by far. For example, in the Caribbean, depending on the seasons, the weather can be as brutal as anywhere else. A sudden arrival of the "Mistral" in the Med will may catch you completely unprepared and scare you. And, very importantly, make sure that you know where to get your daily weather reports. Exotic locations can be challenging to get your reports. TIP: For your first charter day, plan a short down wind or reach sail. Try not to schedule a long beat segment on your first day. Give yourself and your crew time to unwind and take your marks on the boat and the area. Keep that long beat segment for the middle of the week. You will not escape at least one of those, anyway! CAUTION: Especially in the Caribbean, be very careful about sunset times. The sun sets very quickly over there and you do not want to be caught sailing in the dark. a) Charter companies strictly forbid it. b) You will be really scared, as the reefs and shallow areas are everywhere in particular in the Bahamas. 90% of the time, it takes longer than expected to sail from point A to point B. It is not a good idea to have too ambitious an itinerary in terms of distance covered. Unless you have no choice, a reasonable day should cover 15/25 miles at most depending if you are beating or not. Some areas are exceptions to this, but that is the rule of thumb. This should allow you to sail in the morning, stop for lunch, do some snorkeling, and then sail in the afternoon to your night anchorage. So unless you know the area very well, reduce your itinerary. It is a very bad idea to try to cover huge grounds every day, because you might get at your destination very late, and it could be dark, or there could be no more moorings balls or safe anchorage room. As a result, you will get scared or at least nervous. Totally unnecessary. Personally, I always schedule at least 1 or 1.5 day per week of charter where we just stay put and relax. For that, of course, we choose an anchorage that has a lot to offer, like peace, nice snorkeling, a great beach, a hiking trail, or a good restaurant, etc. Don't forget that a charter cruise need not be a race - You're supposed to take it easy! TIP: While plotting your itinerary, take notes of everything you have questions about or that you do not understand. This is your list of questions to ask the briefer when you get at the pre-charter briefing, which you need to attend, with your chart please! The briefer will give you the latest news and updates, like some markers missing in this channel, etc. The usual navigation tools: Charts, dividers, parallel rules, pencils, hand held compass, binoculars. All this is usually aboard every charter boat, but I am used to bring my own in my sail bag, because I know I can rely on my own equipment. Also, binoculars in charter boats are not always in good shape either! But this is not an obligation: just make sure this gear will be on the boat by calling the charter company in advance. Nowadays, charter boats are equipped with a GPS and/or a chart plotter - no radar though. Make sure the manual is on board or you will be very frustrated when trying to use it. I also bring my own hand held GPS. I use a really basic one, and it is perfectly sufficient. Don't forget extra batteries. Some charter companies send you, with your charterer package, a "baby chart" of the cruising area. It is a nice document to get a general idea about the area, but it is not to be used as a navigation chart. Let's add to this polarized sunglasses. They are crucial especially in the Caribbean, because they both heighten the colors and eliminate glare. Thus they allow you to see literally under water and spot those lethal coral heads. TIP: To avoid writing on my charts and damaging them, I use yellow "Stickies" to mark my positions and make notes on the chart under sail. By the way, you should always keep your chart handy in the cockpit, but in a protected place so it does not fly away. The navigation system of the area you will cruise. The markers and buoys must be clearly understood. In the USA, South America, and most of the Caribbean, the lateral system of red-right-returning is in use. It means that when entering a channel to return to a marina or an anchorage, the red markers must be on your starboard (right) side. Conversely, in Europe, Australia, New Zealand, the red markers must be on your port (left) side when returning. Understand how your depth sounder shows the depth. Before leaving, ask the briefer if the marked depth is the depth under the keel or under the hull. If the latter, add the height of the keel to find out your depth clearance. The notion of right of way is interpreted rather loosely in many areas of the Caribbean. So when in doubt, you take evasive action, even if you unquestionably have the right of way, especially when you will cross path with a local ferry. Once again, you cannot sail at night with a charter boat. Night navigation means real trouble, because in case of an accident, you will have no insurance coverage. So pay a lot of attention to your sailing time when planning your cruise and when you leave an anchorage for the next. In doubt, be smart: Stay where you are. You'll leave the next morning. Trust me on this. Know how to interpret the colors of the water. Simple: The lighter the color, the less depth there is. Very light blue/white indicates sand (good for anchoring) while dark black/brown spots indicate rocks and grass (poor holding). At all times, polarized sunglasses will greatly enhance your vision of reefs, rocks and coral heads. If you know you are going into a tricky segment of your trip, involving negotiating reefs and narrow or shallow areas, make sure you do it around midday, when the sun is directly above you. If you know you will get into a reef area by the end of the afternoon, simply do not do it. Know how to use the VHF. At the briefing, you will be given the channels used locally and by the charter company in the area, in case you need help. If you have kids aboard, do not let them play with the VHF on Channel 16. It is the universal emergency channel, and other mariners do not appreciate misuse of it. At the briefing, you will also be given the frequencies for local weather information. Write all this down carefully. Most importantly: When in doubt about anything, take the safest course of action. You will never look dumb: you will be a prudent mariner.